Congrats to the Philadelphia Phillies for a hard fought, clean series. the games on the field were some of the best all-around baseball we have seen played against our Tampa Bay Rays this year. You deserve the win, and the celebration. The play where Chase Utley threw to Phillies catcher Carlos Ruiz at the plate with the Rays, Jason Bartlett barreling in on him was on the money and the play of the game. Broad Street deserves this win, and the Phillies and their organization can be proud of the way they handled themselves on the field during the World Series. Congrats to Pat Guillick, who kinds wavered a bit there. Maybe he will comer back for another season Phillie fans? Go celebrate Philly as we plan and have our own party for our boys in downtown St. Petersburg on Saturday, November 1st. It was an end to an incredible season for both teams. We still have a million things to be proud of this season with the Rays. I will be posting a World Series Game 5.5 blog in the morning. I think it is only fitting that we let the Phillies celebrate and relish the acccomplishments they have earned this season. In hindsight, it might have taken almost 48 hours more than planned, but the celebration is going on wild in the streets of Philly right now. So, come back in the afternoon for my wrap-up of tonight’s game and for the latest news on the Rays celebration in St. Petersburg on Saturday. 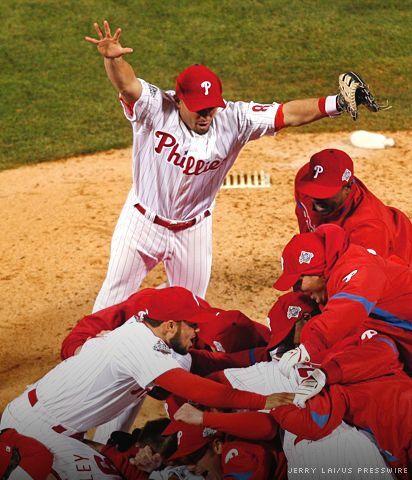 Again, Congrats Phillies on a great season and World Championship.